For the past couple months Intel has been hinting at their interest in Chromebooks by promoting them on the Intel Education website, and today the chip maker removed all doubt. Intel launched a new Education Chromebook reference design on Tuesday, and they expect the first model based on the design to launch later this year. This is the 4th laptop reference design which Intel has offered via Intel Education, and it is the first model that did not run Windows. Few details are available as of yet, but Intel has said that, like Intel's previous designs, the new Education Chromebook has a ruggedized shell. This laptop is powered by an Intel Bay Trail CPU, and it features a camera which can be rotated so it either faces the student or teacher. Intel already has one device maker lined up to use the design, CTL, which plans to be ready to ship to schools later this year. In addition to Intel's new reference design, several other Chromebooks were unveiled today including models from Dell, HP, and this beauty from Lenovo. 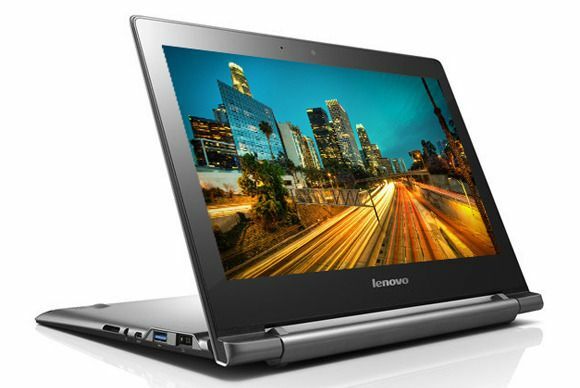 The Lenovo N20 is a distant cousin to the Lenovo Yoga convertible laptops. It doesn't have the 360 degree hinge found on the Yoga, but it does offer a 300 degree hinge which could prove very useful. While Lenovo has produced a couple Chromebooks already, the N20p and its plainer, cheaper cousin, the N20, are Lenovo's first Chromebooks aimed at the consumer market. These laptops have 11" screens, Intel Celeron CPUs, Bluetooth, Wifi, and a 1MP camera. They will ship with up to 4GB RAM and up to 16GB of internal storage. Lenovo is promising 8 hours of battery life, but since this is Lenovo 4 hours would be a more realistic estimate. The N20 will cost $279, and it is scheduled to be available in July. The N20p will start selling for $329 in August.